Open to members and non-members. The fee for the shoot is $5.00 for members, $10.00 for non-members, and $4.00 for children. Members of the Michigan Bow Hunters receive $1.00 off. (just show your membership card). Our 3D course is setup on a nicely wooden portion of the club’s 87 acres and runs along a stretch of the beautiful Johnson Creek, known for its brown trout population. The course is made up of mostly Rinehart and McKenzie 3D wild game targets ranging from a full sized grizzly and elk to smaller turkey and javelina, including deer, bear, boar, and coyote along with some novelty targets such as alligator and stegosaurus. Just to make the course a bit more challenging and fun we also have 2 optional targets. You can score extra points if you choose to shoot these instead of the standard 3D targets. One of these is a “bonic buck”, which is a steel target. The other is a moving target. There are 15 lanes with 2 targets per lane. There is also a practice lane at the beginning of the course for you to warm up on. Three of the lanes have elevated platforms. It takes approximately 2 hours to shoot and complete course. Open to members and non-members. The fee is $30.00 for members and $45.00 for non-members. It runs thirteen weeks on Thursday evenings beginning January 3, 2019 through March 28, 2019 from 6:00pm to 9:00pm. Practice will start at 6:00pm if set-up has been completed early enough. 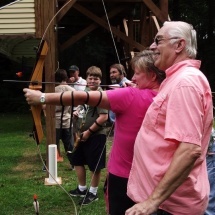 The Indoor Archery league is an adult league that is held in the WWCCA Clubhouse. On the last day there is a great pizza party and awards are given out. For the past few years, we have been using newly designed target butts which allows us to add an additional lane of shooters. We can accommodate 42 shooters. We also have new design bow hangers. This design allow us to hang just about every type of bow and take up less space so there is less congestion around the shooting line. Come out and shoot the indoor league in our cozy warm clubhouse where you never have to worry about the nasty weather outdoors. Come out early to help set up and get some of your required work hours in. Open to members and non-members. Every Tuesday at 6:00 p.m. from June 4, 2019 thru August 27, 2019 except for July 2nd. Open to members and non-members. Cost is $30.00 for members and $45.00 for non-members. We shoot May thru September from 9:00am – 1:00pm. The format is called “American 900”, where you shoot a total of 90 arrows at various distances. It takes about 2-1/2 hours to complete so please show up early enough to make sure you are finished by the 1:00pm ending time. As is typical with any archery league, you must shoot at least 3 of the 5 matches including 1 out of the first 2. Here is an opportunity to try your hand at long distance shooting. It may seem daunting at first but you will quickly be amazed at how accurate you can be. Open to members and non-members. Cost is $30.00 for members and $45.00 for non-members and half price for juniors. The league runs November – March from 9:00am – 1:00pm. 2D animal targets at unknown distances out to 30+ yards. 6 arrows at 5 targets from the ground and then 6 arrows at 5 targets from the platform for a total of 60 arrows. As with any archery league, you must make a least 1 of the first 2 matches and at least 3 of the 5. Come on out and join us for some Winter outdoor archery fun on the Outdoor Stand-Up Range! It may be cold and snowy at times, but we always have a wood fire going to help you stay warm during the shoot. Any archery equipment is allowed. Sights, no sights, traditional, fingers, release or crossbow. You can shoot whatever you want as long as it is considered archery equipment and can shoot 60 arrows within the time of the match. Open to members and non-members. Cost is $30.00 for members and $45.00 for non-members. We shoot on Thursday evenings from 6:00pm until 9:00pm beginning June 6, 2019 thru August 29, 2019. Come out and join us at the Stand-up Archery Range for the Bow Hunters Tune Up! This event is designed to be a practical shooting setting to better prepare the shooter for the hunting season. Any type of bow is welcome, including crossbows. We will be shooting out to 20 yards, 30 yards and 40 yards from the ground and from 13’ and 17’ elevated platforms. You can even shoot out to 70 meters (77 yards) if you wish. In the later weeks for this event, we set up 3D targets to add more hunting realism to this event. Also, there is a broadhead pit where you can tune your bow to shoot your hunting arrows with broadheads. Another feature of Hunter Tune Up is that you will earn certificates verify your proficiency as you progress through the various shooting distances. WWCCA club certificates are awarded for meeting required shooting scores from both the ground and shooting platforms. In addition, you can earn NAA (National Archery Association) certification shooting longer distances of 30, 50 and 70 meters! This is a great opportunity to learn how to shoot the longer distances that are often needed when hunting those western states. We supply targets and back stops. You supply the fun! This is also a great opportunity to share info about hunting equipment whether is the “tried and true” for the “latest and greatest”! Plus, at the end of the season we have a picnic with great food and refreshments, and the opportunity to swap hunting stories.